The Eresma viaduct forms part of the SG-20 Highway expansion, the future ring road around the regional capital. It comprises one of the most heavily used transportation networks in the area, with the current volume of traffic tripling what was predicted in 2002, with 18,000 rather than 6,000 vehicles daily. The uniqueness of this structure lies in its arched shape, with the deck placed on the upper part of the arch. 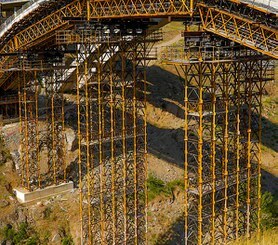 For the arch, ULMA proposed a gantry falsework solution set on foundation to span the precipitously steep terrain. The geometry of the arch was formed with 20 m long H-33 Trusses to support the double sided formwork system used to form the curve. The shoring system consisted in T-500 towers reaching 40 m in height, without the need for any additional bracing. The entire arch was built with only five supports. The technical support teams of ULMA and the client worked together throughout the project to optimise every solution, with an eye toward saving material and reducing costs. Given the short distance between piers, the solution chosen for the deck consisted in a system of supporting brackets set on the pier caps, upon which the formwork was directly supported. Thus the pier itself served as a shoring system, making it unnecessary to modify the terrain in order to assemble shoring structures on the ground. 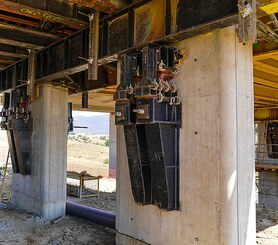 All of the collective protective equipment necessary was supplied for the shoring towers, trusses, and formwork, making it possible to complete all auxiliary work in complete safety.